As some of you might know, I did have a bit of involvement in the founding of EDEN'S CURSE. For example for their debut, I co-wrote a few tunes and also gave them permission to record the unused EVIDENCE ONE track "Eyes Of The World" (which they did an amazing version of!). 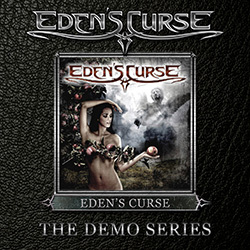 Long story short, as a special to the fans, the boys at EDEN'S CURSE have now released a series of demo CDs, which include those for their first album, featuring my demos and the original E1 demo version of "Eyes Of The World".